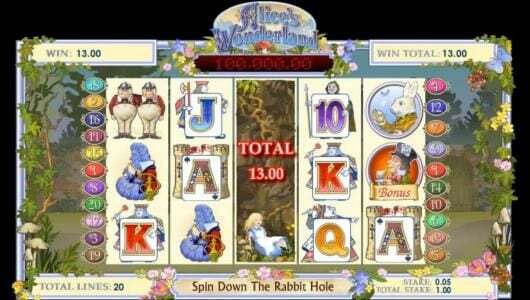 Alice's Wonderland Slots has not been reviewed yet, be the first to rate this slot. 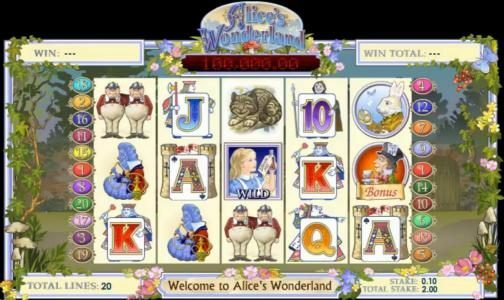 Alice’s Wonderland, a game designed by the guys from Ash Gaming, offers its players 5 reels and 20 paylines, with the features being scatter symbols, wilds and free spins. The game has a top jackpot of $250,000. Alice’s Wonderland is based on the adventures described in the book Alice in Wonderland, written by Lewis Carroll. 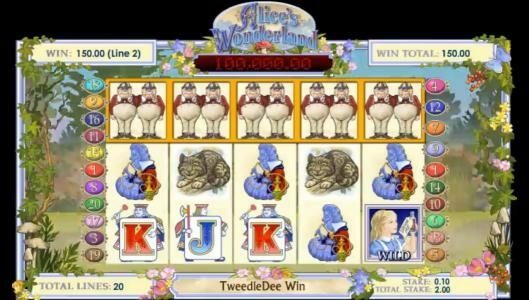 You will notice that the cartoon style of the design that was chosen for this slot is quite appropriate, and it’s the kind of drawing you will actually see in some books. The game has a lot of detail and thought put into it, and it’s a good looking title overall. There are a lot of plants and flowers everywhere around the screen, both around the reels, and around the margins of the display. 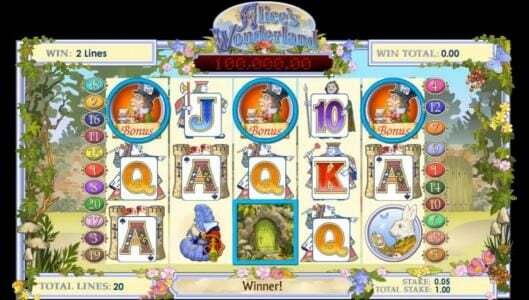 The symbols available in the game include the Mad Hatter Scatter, Alice in the role of a wild, the Rabbit Hole Scatter, the Free Spins Scatter, the Cheshire Cat, the twins and the card symbols from 10 to A, which are all very well made, and designed to look like they belong in this slot. One of the options that the player has when it comes to betting, is to select the number of lines which he is going to place a wager on. The maximum number is 20 lines, which can bet a stake between $0.01 and $25 each one. 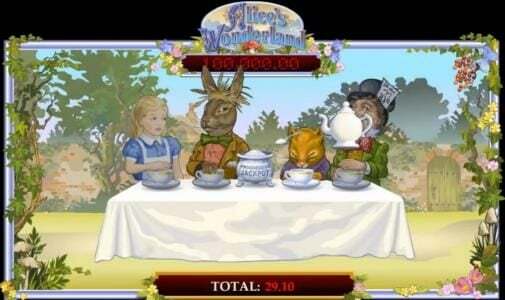 The resulting top wager of Alice’s Wonderland would be $500, an impressive bet, but one that can result in a huge payout, of $250,000. 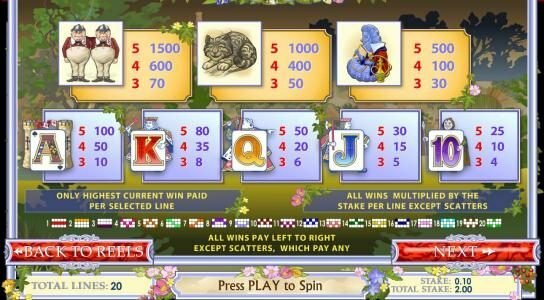 You will find that the Slot makes heavy use of scatter symbols, using them for various Bonus rounds and free spins. 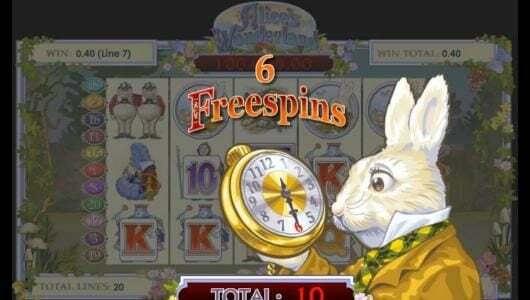 The Free Spins Scatter is the one with the rabbit on it, and the player will need a total of three symbols with this character. 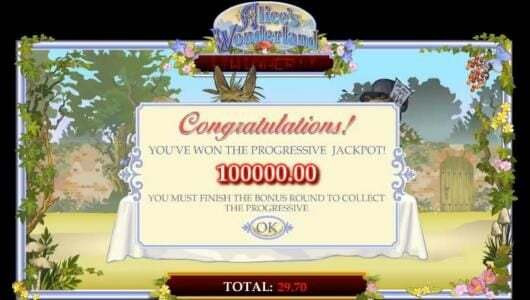 When that happens, a bonus round called Pocket Watch will begin, where the player will win free spins and sticky wilds. 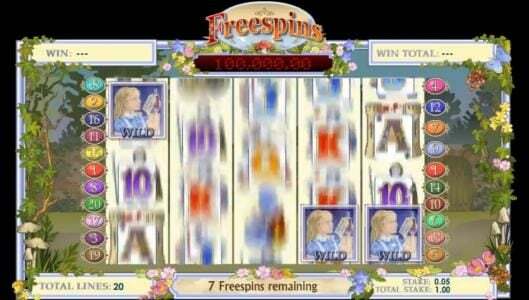 There are 7 to 20 Free Spins available, plus sticky wild symbols, which remain in place while these free games are used. 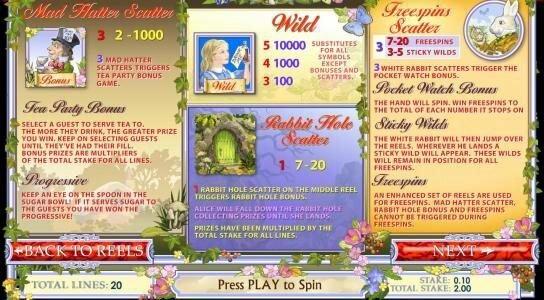 The Rabbit Hole Scatter would be the next one, and you only need one of these symbols to activate its bonus round. The payout offered here varies between 7 and 20 times the total bet, so up to $10,000 can be won. 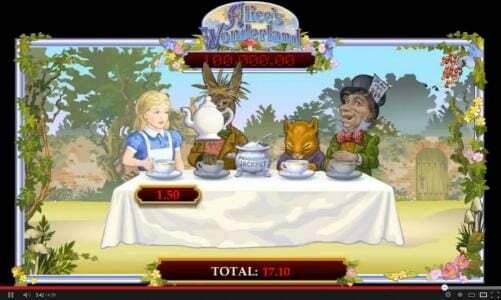 Mad Hatter Scatter is the last of the scatter symbols, and with three of them appearing in the game, the Tea Party bonus round activates, and it will have prizes between 2 and 1000 times the total wager. 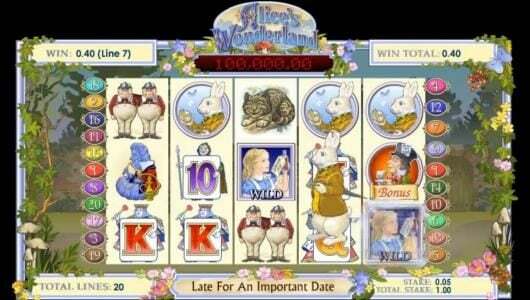 Finally, we have the wild, with Alice on it, the symbol which acts as a substitute, but it also pays the game’s top jackpot when five symbols take over a line. As you can see, the game is full of features, and since it has huge prizes and a beautiful design as well, there is absolutely no reason for you to avoid it.